And, what’s more, I’m telling the computer to approach this as if this is the 2015 MLB season, so they’ll use the same tendencies that MLB teams would. Yes, that means that there will be over 2.8 times the average amount of home runs. The batting averages can be expected to be 1.364 times the average. There will be far fewer doubles and it should be LITERALLY IMPOSSIBLE to hit a triple (however, some people do, in fact, hit triples). I wonder how my scout assesses this ballpark? That’s some damn deep analysis, bird-dog. So, anyway, game 1, against the Baton Rouge Silver Swords. Here goes nothing! 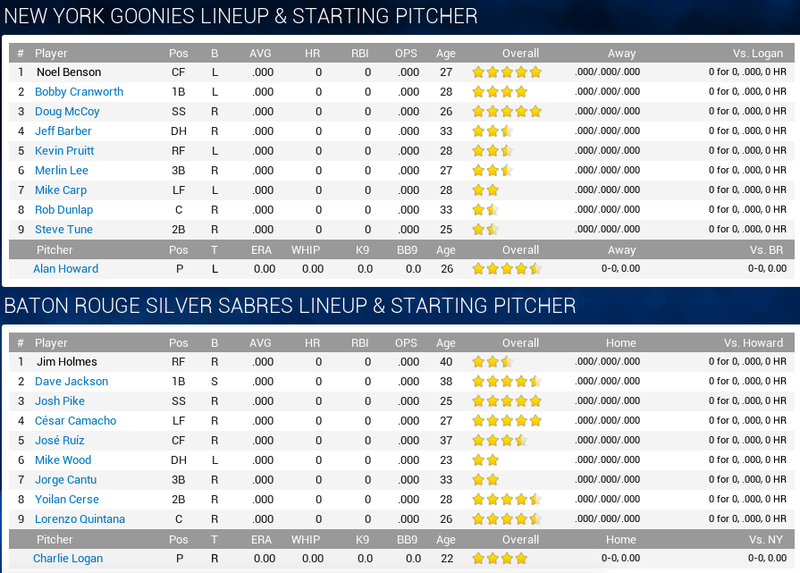 After my Goonies go 1-2-3 in the first (with every damn hit being right at a guy), the Silver Sabre lead-off man, Jim Holmes, starts off with a solo bomb at a whopping 249 feet. I have this image in my head of him just barely moon-shotting it over the fence with something that would have been a lazy fly ball out in any actual baseball game. Amazingly, that’s the only run of the inning. I then simulate to the 8th inning, and “wake up” to find that the Goonies are losing 14-4. Lovely. Baton Rouge has had 6 home runs. 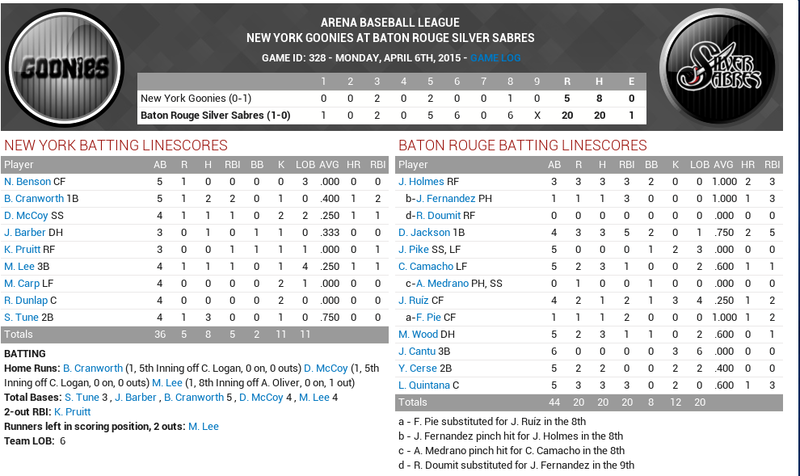 While I score one run in the top of the 8th, the Silver Sabres respond with 6 in the bottom of the 8th. In the end, the final score is 20-5. Oof. I then simulate to the end of the first week. It’s been a wild week. In their second game of the year, the Goonies won 17-15 in 12 innings. 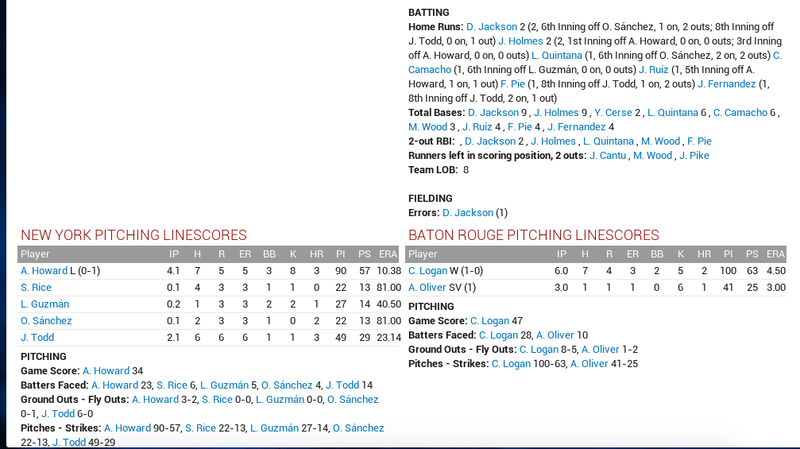 In a game on Friday, Baton Rouge scores 13 runs in the 8th inning to beat Los Angeles, 24-15. On Sunday, the Goonies beat LA 36-3, hitting 13 home runs in the process. The season goes on. On April 13th, Brooklyn scores 7 in the bottom of the ninth to beat San Jose, 20-19. Looking back at the hitting leaders, the man who most stands out is Jose Ruiz of Baton Rouge. Truly, this man is a Destroyer of Worlds. At one point in April, he homered in 15 straight games (real-world regular baseball record: 8). He is on pace to finish the season with 216 home runs, more than the career total of Kansas City Royals great Mike Sweeney. He’s hitting .409, and that’s over 100 points below the league leader, Doug “Rock” McCoy of the Goonies. The season goes on, and on May 9, Baton Rouge and LA have perhaps the craziest game yet, as the LA Thunder win 28-26 in 10 innings. By June 1, Jose Ruiz has 60 home runs, but has been overtaken as HR leader by J.R. Miles of Phoenix, who has 63. 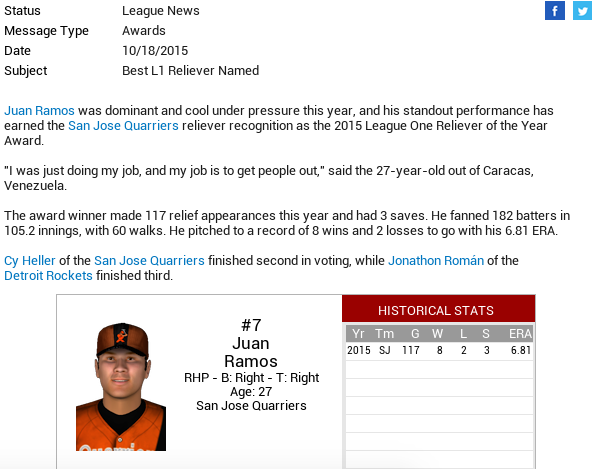 The lowest ERA by qualified starting pitchers is Juan Carlos Jimenez’s 6.12. Ron Johnston of Glendale leads the starters in fewest HR/9… with 2.54. Later that month, the All-Stars are announced. It’s… quite the group. No pitcher selected to a teams are below 5.65. Jorge Cantu, one of the few “real” players, is selected for his .394 batting average and 37 HRs. Yeah, look at J.R. Workhorse Miles is leading with 91 HRs. At the All-Star Break. He’s on pace for 197 home runs on the year. He also leads in RBI at 189, or just two away from Hack Wilson’s single-season record of 191. Abandon all hope! Abandon all hope! The All-Star Game goes to League Two (the DH League) in 17-8, with Jorge Ruiz and Ryan Doumit (another one of the real players left over) both hitting two home runs. By the end of July, five hitters have more than 100 home runs. Four have more than 200 RBIs. Six have more than 200 hits. The doubles leader, in contrast, has 11. The triples leaders are tied at 2. Josh Pike of the Silver Sabres saw a hit streak end at 50 near the end of the month. On July 18th, the Phoenix Roadrunners beat the Goonies 39-7, with Wenty Burton racking up 13 RBIs, 3 HRs and five walks. As far as I can tell, there have been a grand total of two shutouts the entire year so far, and even then they weren’t complete games but rather joint efforts. The next night in Baton Rouge, Miles grounds into a double-play to end the first inning, and then does the same in the fourth. I find it fascinating that even if you have the players play in a stadium with essentially no outfield, it took until September for somebody to beat DiMaggio. Had Miles not done it, it’s possible nobody would have. Go figure. What’s more, by the end of the season Miles has beaten DiMaggio’s minor league mark of 61 and is only kept from tying or breaking Jim Wilhoit’s streak of 69 by the fact the season ends after Miles has hit 68. That is only minor breakage, but it’s still definitely breakage: Out Of The Park Baseball is not meant to have people hitting triple-digit HRs in a single season. It isn’t meant to have people with 4-digit slugging and OPS. If somebody were to have a four-digit HR total (which would probably happen over a career if I ran this more than one season), it would probably cause the numbers to either break utterly or to start literally overlapping on each other. The pitcher with the fewest HR per 9 IP still gave up nearly three and a half dingers a game. The WAR leader, Ron “Yard Man” Johnston, isn’t eligible for ERA or other leaderboards, but still went 16-1 with a 5.35 ERA. Oh, and Baton Rouge ended up winning the title. Good for them. Now, let’s look at the awards at the end of the season and how insane they are if we were to look at them in a real-world context in a league that didn’t have arenas for games. 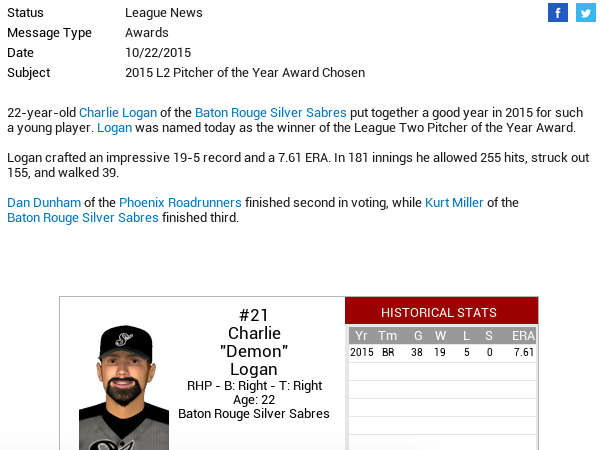 A guy with three saves, NOT EVEN THE MOST ON HIS TEAM, won best reliever in League One. Oh, he struck out a lot of people, and his win-loss wasn’t bad, but, man, that 6.81 ERA would get anybody in a real league sent down, if not outright released. 17 saves! And a 7.36 ERA. Oof. 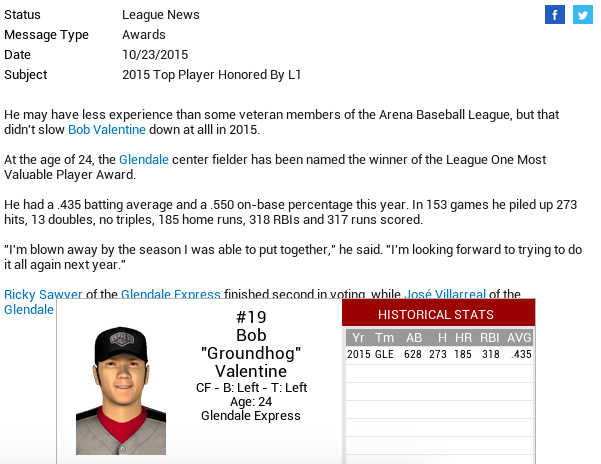 He allowed 255 hits, but a 7.61 ERA is like a 2.00 ERA in the Arena League, I guess. J.R. Miles. Of course it’s J.R. Miles. 6,429 HRs were hit during the season. 14,020 runs were batted in. There were 18,552 hits. The LEAGUE had a slash line of .365/.428/.758. And that’s with pitchers hitting in one of the leagues. OH DEAR GOD MY EYES! Look at that 10.78 LEAGUE ERA! Oh, and there were THREE shutouts all year. And, get this, I’m reasonably sure that this simulation may have been conservative. Imagine, if you were, if a real stadium was built with the micro-dimensions and 42-foot-high fences, it’d be so radically different from baseball as we know it that it’d basically become a different sport altogether. Yes, there’d be plenty of cheap sky-high pop-up home runs, but think of all of those line-drives and such that would be bouncing off the wall. There would be TONS, far more than in any of the simulations I did. And, depending on what the wall was made up of, they could literally be hitting the outfield wall and bouncing all the way back to the infield, perhaps all the way into the infield stands for (presumably) a ground-rule double. And with that in mind, it’s likely that the defensive positioning would be radically different. 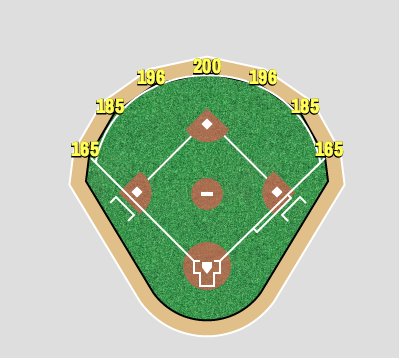 It’s likely there wouldn’t be any outfielders at all, and instead it’d be 7-man infield all the time. Really, there is no way to know what crazy form this Arena Baseball would take. 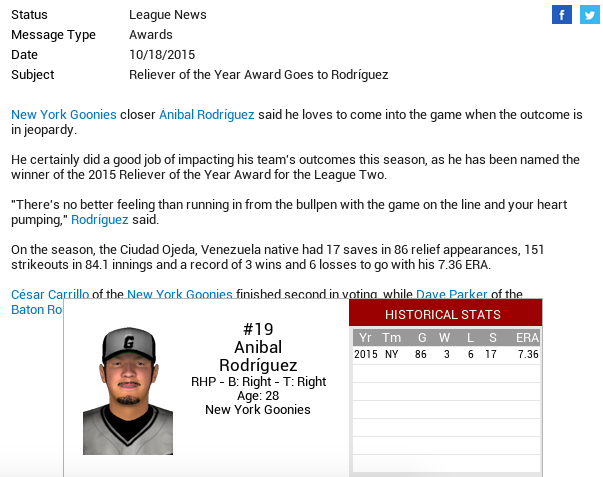 OOTP‘s statistic pages can’t handle so many homers and so high of SLG and OPS. In the land of the dinger, the man with the sub-8 ERA is king. Even if games are being played in stadiums that should not allow any triples, people will still hit triples, because baseball is weird. Even in the most bandbox of bandboxes, there’s no guarantee that somebody would break Joe DiMaggio’s streak. Seriously, if Miles hadn’t gotten it, it’s likely that nobody would have. Now, what if YOU want to have a baseball arena? Well, you can here! 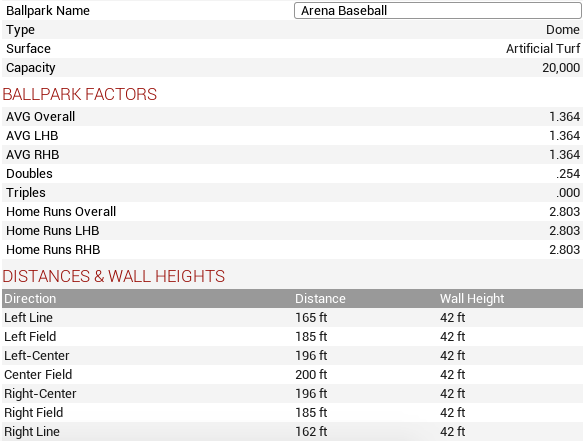 That will provide you the park file that you can then assign to various teams in OOTP to simulate your own Arena Baseball League! Special Thanks to the OOTP Park Generator, MediaFire, and Out Of The Park Developments- ParkGen for figuring out the park factors for a microstadium, MediaFire for hosting the download, and OOTP Developments for creating the game itself. NEXT TIME ON BREAKING OOTP: The Mariners just got some help. 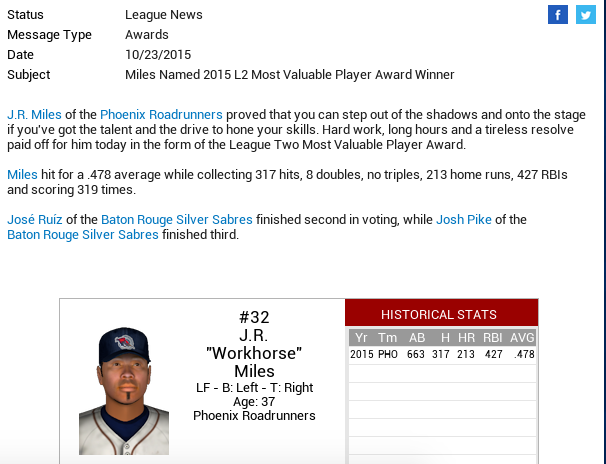 This entry was posted in All-Encompassing, Baseball, MLB, Video Games and tagged Arena, Arena Baseball, Breaking OOTP, DINGERS, Home Runs, J.R. Miles, OOTP, OOTP Baseball, Out of the Park, Out of the Park Baseball, video game by danglickman. Bookmark the permalink. If only Jim Foster had invented this game as opposed to Arena Football.